Here is a link to a page of recent sound recordings at Greenbank Parish Church. Here is a link to a page of recent video recordings at Greenbank Parish Church. Regular Sunday morning worship (outwith the summer services - see below) takes place at 10.30am, continuing our “blended” approach of contemporary and traditional influences. However, there will be one “Summer Service” at 10am throughout the summer, running from Sunday 30th June 2019 until the Holiday Club service on Sunday 11th August 2019, which will see us return to 10.30am. The summer services take place in the Church, are around 45–50 minutes in length, and are shaped to engage all ages in our church family. Crèche runs as usual on each summer Sunday, and there is coffee after the service in the Main Hall. 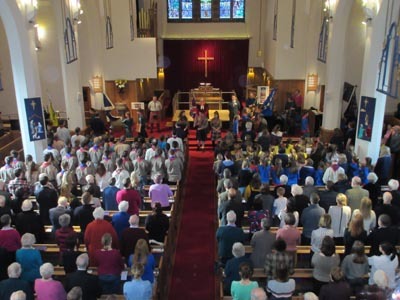 In addition, a 'First Sunday' service is held in the Centenary Hall at 9.30am on the first Sundays of some months and led by members of the congregation through particular groups, such as the Guild and the Monday Bible Study Group. 3pm Afternoon Communion in the Braid Room. Holy Communion is also held on Easter Sunday and at Pentecost at 9.30am in the Braid Room. A Quiet Communion service is held at 9.30am on the third Sunday of every month except June and July in the Braid Room. This service is designed to be reflective and peaceful, offering a contrasting mood to our other communion celebrations. There is a crèche available for children under 3 during all 10.30am services (10.00am in the Summer).